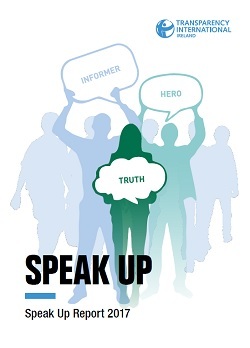 TI Ireland has published its second Speak Up report based on data collected from over 850 callers to its Speak Up helpline from 2011 to beginning of 2017. The Speak Up Report 2017 notes a significant increase in complaints from the public about the Gardaí to the helpline. The largest number of Garda-related complaints related to the alleged failure to investigate crimes reported to them. The Health sector generated the second largest number of calls to the helpline during the same period. The most common concern raised by callers from the sector was whistleblower reprisal. The Banking and Finance sector appears in the top three most complained about sectors for the first time. The largest number of complaints to the Speak Up helpline were made about retail bank lending practices and the conduct of ‘vulture funds’. The report also includes the findings from the Integrity at Work Survey 2016 which, for the first time, measured the attitudes and experiences of Irish private-sector employees and employers to whistleblowing. The Integrity at Work Survey found that of those only 21% of those that say they reported wrongdoing suffered as a result and 28% of those that reported said they benefited. Despite the relatively low percentage of reported reprisal, the Integrity at Work’s Survey’s findings suggest that an estimated 33,000 workers claim they have suffered as a result of speaking up at work. TI Ireland also included recommendations out how the Protected Disclosures Act can be strengthened to make sure it is fit for purpose. The recommendations include; extension of whistleblowing protections to volunteers and students; the removal of caps on compensation for awards to workers who are found by the Workplace Relations Commission to have suffered a detriment as a result of making a protected disclosure; and the reversal of the burden of proof to employers to show they were not responsible for the penalisation of a whistleblower.